The great weird state of Wisconsin is full of high strangeness, from our cannibal killers to our eccentric roadside attractions, and all the ghosts in between. The Wisconsin Frights blog explores the dark nooks and crannies of these legends and lore, while keeping up with the latest Halloween, haunted house, and horror news from the backwoods. The latest episode of the Lore podcast tells the story of a Milwaukee phantom that ended in murder in LA. Mark Borchardt’s latest film examines the curious attendees of a UFO gathering in a small Wisconsin town. Paranormal researcher Tobias Wayland discusses reports of a large winged creature witnessed around the shores of Lake Michigan. The skeletons are hunting, fishing, and camping in this year’s annual Halloween display near Holy Hill. Wednesday and Shadow arrive at the House on the Rock in the new teaser for season 2 of Neil Gaiman’s American Gods. Windigo Fest’s second year was bigger and spookier in every way, despite Christian group’s prayers against it. This documentary cracks open Wisconsin’s bizarre werewolf file to reveal the startlingly dark origins of the beast that stalks Bray Road. Frankensteins, skulls, and other spooky Mold-A-Ramas have been unleashed at the zoo for the Halloween season. After three failed execution attempts, English murderer John “Babbacombe” Lee secretly lived out the rest of his life in Milwaukee. Map reveals the favorite Halloween candy in each state. Gags the Clown returns to terrorize Green Bay in his feature-length big screen debut this October. 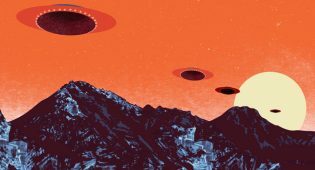 After a 1934 encounter, Coral Lorenzen’s interest in flying saucers lead her to start APRO, the first UFO research organization. Looking for frights this Halloween? These top rated Wisconsin haunted houses are sure to give you chills and thrills this October! Was it a UFO or a misidentified weather balloon that Door County residents saw that day? The perfect birthday card for that special person who already has one of everybody. This diner in Middleton is serving up pumpkin pie in a unique way this fall. Pizza delivery goes horribly wrong in this short horror film created by Mad Cow Productions for the 2018 Madison 48 Hour Film Project. A Wisconsin woman has a bad feeling that proves to be true in this ad for Time-Life’s iconic paranormal book series. Milwaukee police are asking for the public’s help to locate the missing angel. Take a ride into terror in the new video from Terror on the Fox for the 2018 Halloween season. Some of Wisconsin’s top paranormal researchers will be guest speakers at this year’s Mothman Festival in Point Pleasant, WV. Filmmaker Seth Breedlove discusses his latest film on Wisconsin’s own Beast of Bray Road legend. A windigo sighting in Manitowoc can only mean one thing: Halloween is coming and Windigo Fest is lurking right around the corner. Watch the latest trailer for the upcoming documentary about Wisconsin’s legendary Beast of Bray Road. 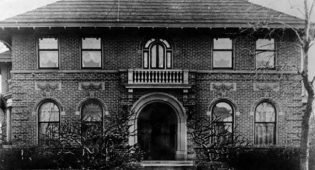 Does the Beast of Bray Road Have Occult Origins? A Beast of Bray Road witness discusses the possible Satanic origins of the beast in this clip from the upcoming documentary. The theater chain won’t show the movie out of respect for those impacted by the 2014 stabbing case. Wisconsin’s notorious werewolf in Elkhorn got national media attention when Inside Edition investigated the claims in 1990. A surreal sculpture garden of defunct roadside attractions and other unusual objects. A Craigslist user is offering up a rock for sale that is “undeniably” a lunar meteorite. A short video clip gives a glimpse behind the scenes of American Gods filming at the bizarre Wisconsin attraction. Visiting a local UFO hotspot during the annual gathering of tin foil hat enthusiasts. The U.S. Forest Service issued a statement regarding posters warning of sasquatch activity in national parks. The Jeffrey Dahmer tour in Milwaukee is featured in a new Netflix series about dark tourism. Ulao may be almost entirely forgotten, but history will not forget the ghost town’s most deranged resident. Marking the anniversary of the Roswell crash with a look at Wisconsin’s own mysterious UFO hotspot. A 9-year-old Green Bay girl reported she was possessed after playing with a Ouija board while her mother was asleep. Video shows a mysterious formation of flashing lights over the lake in Dundee. Linda Godfrey and Lee Hampel discuss the bizarre results of their ongoing experiments on his property near Bray Road. There are a lot of strange things happening in Elkhorn. Mysterious lights and UFOs have been seen in the Dundee area for decades, and possibly even much longer. Is the Ghost of the Edmund Fitzgerald Still Sailing Lake Superior? Lake Superior never gives up her dead, which may be why this wrecked ship is still seen today. Mary Sutherland and her team are mapping the bottom of Rock Lake in search of underwater pyramids, Rocky the lake monster, and other mysterious anomalies reported by locals. Small Town Monsters unleashes the first trailer for a new film documenting one of Wisconsin’s most bizarre and harrowing legends. Was a Werewolf Photographed Near Elkhorn in Beast of Bray Road Territory? In January of 2018 a man claimed to have taken this photo of a wolf walking upright in Elkhorn, Wisconsin near the area of the legendary Beast of Bray Road. Hundreds of unmarked graves can be found in the woods near Asylum Point. Learn the terrifying true story of a local goatman encounter, as well as other bizarre Wisconsin mysteries and legends. Metal Mom and her black Viking ship float will be part of Stoughton’s annual Syttende Mai parade on May 20th. Short film explores the origins of Dead Man’s Carnival from train hopping and street performing to the stage of The Miramar Theater.